For other uses, see Lawn (disambiguation). "Lawns" redirects here. For other uses, see Lawns (disambiguation). A lawn is an area of soil-covered land planted with grasses and other durable plants such as clover which are maintained at a short height with a lawnmower (or sometimes grazing animals) and used for aesthetic and recreational purposes. Lawns are usually composed only of grass species, subject to weed and pest control, maintained in a green color (e.g., by watering), and are regularly mowed to ensure an acceptable length. Lawns are used around houses, apartments, commercial buildings and offices. Many city parks also have large lawn areas. In recreational contexts, the specialised names turf, pitch, field or green may be used, depending on the sport and the continent. The term "lawn", referring to a managed grass space, dates to no earlier than the 16th century. Tied to suburban expansion and the creation of the household aesthetic, the lawn is an important aspect of the interaction between the natural environment and the constructed urban and suburban space. In many[clarification needed] suburban areas, there are bylaws in place requiring houses to have lawns and requiring the proper maintenance of these lawns. In some jurisdictions where there are water shortages, local government authorities are encouraging alternatives to lawns to reduce water use. 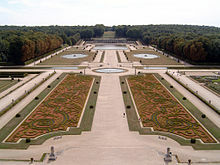 Gardens of the Château de Vaux-le-Vicomte, designed by André Le Nôtre at Maincy. In medieval Europe, open expanses of low grasses  became valued among the aristocracy because they allowed those inside an enclosed fence or castle to view those approaching. Before the invention of mowing machines in 1830, lawns were managed very differently. 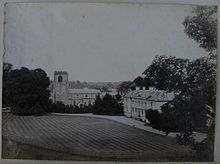 They were an element of wealthy estates and manor houses, and in some places were maintained by the labor-intensive methods of scything and shearing. In most situations, they were also pasture land maintained through grazing by sheep or other livestock. Areas of grass grazed regularly by rabbits, horses or sheep over a long period often form a very low, tight sward similar to a modern lawn. This was the original meaning of the word "lawn", and the term can still be found in place names. Some forest areas where extensive grazing is practiced still have these seminatural lawns. For example, in the New Forest, England, such grazed areas are common, and are known as lawns, for example Balmer Lawn. Lawns similar to those of today first appeared in France and England in the 1700s when André Le Nôtre designed the gardens of Versailles that included a small area of grass called the tapis vert, or "green carpet". The open "English style" of parkland first spread across Britain and Ireland, and then across Europe, such as the garden à la française being replaced by the French landscape garden. By this time, the word "lawn" in England had semantically shifted to describe a piece of a garden covered with grass and closely mown. Wealthy families in America during the late 18th century also began mimicking English landscaping styles. In 1780, the Shaker community began the first industrial production of high-quality grass seed in North America, and a number of seed companies and nurseries were founded in Philadelphia. The increased availability of these grasses meant they were in plentiful supply for parks and residential areas, not just livestock. This all changed with the invention of the lawnmower by Edwin Beard Budding in 1830. Budding had the idea for a lawnmower after seeing a machine in a local cloth mill which used a cutting cylinder (or bladed reel) mounted on a bench to trim the irregular nap from the surface of woollen cloth and give a smooth finish. Budding realised that a similar device could be used to cut grass if the mechanism was mounted in a wheeled frame to make the blades rotate close to the lawn's surface. His mower design was to be used primarily to cut the lawn on sports grounds and extensive gardens, as a superior alternative to the scythe, and he was granted a British patent on 31 August 1830. Farmers at first continued to harvest meadows and marshes composed of indigenous grasses until they became overgrazed. These areas quickly fell to erosion and were overrun with less favorable plant life. Soon, farmers began to purposefully plant new species of grass in these areas, hoping to improve the quality and quantity of hay to provide for their livestock as native species had a lower nutritive value. While Middle Eastern and Europeans species of grass did extremely well on the East Coast of North America, it was a number of grasses from the Mediterranean that dominated the Western seaboard. As cultivated grasses became valued for their nutritional benefits to livestock, farmers relied less and less on natural meadows in the more colonized areas of the country. Eventually even the grasses of the Great Plains were overrun with European species that were more durable to the grazing patterns of imported livestock. 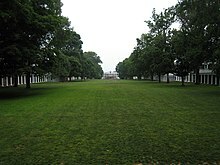 A pivotal factor in the spread of the lawn in America was the passage of legislation in 1938 of the 40-hour work week. Until then, Americans had typically worked half days on Saturdays, leaving little time to focus on their lawns. With this legislation and the housing boom following the Second World War, managed grass spaces became more commonplace. The creation in the early 20th century of country clubs and golf courses completed the rise of lawn culture. According to study based on satellite observations by Cristina Milesi, NASA Earth System Science, its estimates : "More surface area in the United States is devoted to lawns than to individual irrigated crops such as corn or wheat.... area, covering about 128,000 square kilometers in all". Cool season grasses start growth at 5 °C (41 °F), and grow at their fastest rate when temperatures are between 10 °C (50 °F) and 25 °C (77 °F), in climates that have relatively mild/cool summers, with two periods of rapid growth in the spring and autumn. They retain their color well in extreme cold and typically grow very dense, carpetlike lawns with relatively little thatch. Warm season grasses only start growth at temperatures above 10 °C (50 °F), and grow fastest when temperatures are between 25 °C (77 °F) and 35 °C (95 °F), with one long growth period over the spring and summer (Huxley 1992). They often go dormant in cooler months, turning shades of tan or brown. Many warm season grasses are quite drought tolerant, and can handle very high summer temperatures, although temperatures below −15 °C (5 °F) can kill most southern ecotype warm season grasses. 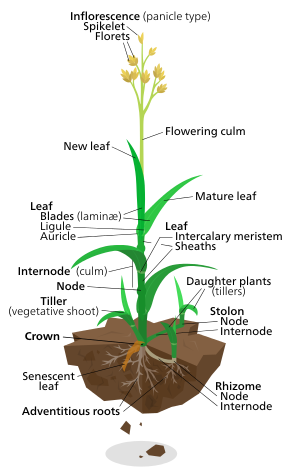 The northern varieties, such as buffalograss and blue grama, are hardy to 45 °C (113 °F). Some lawns are replaced with low ground covers, such as creeping thyme, camomile, Lippia, purple flowering Mazus, grey Dymondia, creeping sedums, and creeping jenny. An example of this is the floral lawn in Avondale Park. Other alternatives to lawns include meadows, drought-tolerant xeriscape gardens, natural landscapes, native plant habitat gardens, paved Spanish courtyard and patio gardens, butterfly gardens, rain gardens, tapestry lawn and kitchen gardens. Trees and shrubs in close proximity to lawns provide habitat for birds in traditional, cottage and wildlife gardens. Sodding (American English), or turfing (British English), provides an almost instant lawn, and can be undertaken in most temperate climates in any season, but is more expensive and more vulnerable to drought until established. Hydroseeding is a quick, less expensive method of planting large, sloped or hillside landscapes. Some grasses and sedges are available and planted from 'liner' and 4-inch (100 mm) containers, from 'flats', 'plugs' or 'sprigs', and are planted apart to grow together. Various organic and inorganic or synthetic fertilizers are available, with instant or time-release applications. Pesticides, which includes biological and chemical herbicides, insecticides and fungicides, treating diseases like gray leaf spot, are available. Consideration for their effects on the lawn and garden ecosystem and via runoff and dispersion on the surrounding environment, can constrain their use. For example, the Canadian province of Quebec and over 130 municipalities prohibit the use of synthetic lawn pesticides. In order for the lawn to grow and flourish, the soil must be prepared properly. If this step is overlooked as many do, the lawn will burn out as soon as it runs out of nutrients. The Ontario provincial government promised on 24–2 September 2007 to also implement a province-wide ban on the cosmetic use of lawn pesticides, for protecting the public. Medical and environmental groups support such a ban. On 22 April 2008, the Provincial Government of Ontario announced that it will pass legislation that will prohibit, province-wide, the cosmetic use and sale of lawn and garden pesticides. The Ontario legislation would also echo Massachusetts law requiring pesticide manufacturers to reduce the toxins they use in production. 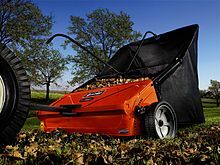 Lawn sweepers clean up debris from dethatching in addition to leaves, twigs, pine needles, etc. Placard against pesticides: "I love my family and the environment more than my lawn". Lawns can reduce biodiversity, especially when the lawn covers a large area. Lawns promote homogenization and are normally cleared of unwanted native plant and animal species, typically with synthetic pesticides. They may be composed of introduced species not native to the area, particularly in the United States. This can produce a habitat that supports a reduced number of wildlife species. Lawn maintenance commonly involves use of inorganic fertilizers and synthetic pesticides. These cause great harm. Many are carcinogens and endocrine disruptors. They may permanently linger in the environment and negatively affect the health of potentially all nearby organisms. The United States Environmental Protection Agency has estimated[when?] nearly 32,000,000 kilograms (71,000,000 lb) of active pesticide ingredients are used on suburban lawns each year in the United States. There are indications of an emerging regulatory response to this issue. For example, Sweden, Denmark, Norway, Kuwait, and Belize have placed restrictions on the use of the herbicide 2,4-D. It has been estimated that nearly 64,000,000 litres (14,000,000 imp gal; 17,000,000 US gal) of gasoline are spilled each summer while re-fueling garden and lawn-care equipment in the United States: approximately 50% more than that spilled during the Exxon Valdez incident. The use of pesticides and fertilizers, requiring fossil fuels for manufacturing, distribution, and application, has been shown to contribute to global warming. (Sustainable organic techniques have been shown to help reduce global warming.) A hectare of lawn in Nashville, Tennessee, produces greenhouse gases equivalent to 697 to 2,443 kg of carbon dioxide a year. The higher figure is equivalent to a flight more than halfway around the world. Lawn mowing is one element of lawn culture that causes a great amount of emissions. 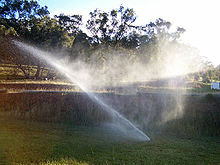 In the United States, 50 to 70% of residential water is used for landscaping, most of it to water lawns. A 2005 NASA study "conservatively" estimated there was 128,000 square kilometres (49,000 sq mi; 32,000,000 acres) of irrigated lawn in the US, three times the area of irrigated corn. ^ Encyclopedia of Urban Studies. SAGE. 2010. pp. 441–45. ISBN 9781412914321. ^ "Online Etymology Dictionary". Etymonline.com. 10 June 1927. Retrieved 11 June 2013. ^ "laund". Oxford English Dictionary. Retrieved 27 March 2013. ^ "Etymology for "lawn"". Etymonline. Retrieved 5 June 2015. ^ "All You Need to Know About Lawn History". The Lawn Institute. Retrieved 20 March 2019. ^ Hostetler, Mark E. (2012). The Green Leap: A Primer for Conserving Biodiversity in Subdivision Development. University of California Press. ISBN 9780520271104. ^ "Lancelot Brown". Encyclopædia Britannica, Encyclopædia Britannica Online. Encyclopædia Britannica Inc. 2007. Retrieved 12 March 2012. ^ "Lancelot 'Capability' Brown (1716–1783)". Kew History & Heritage. Kew Gardens. Archived from the original on 8 October 2012. Retrieved 16 March 2012. ^ "History of British Gardening Series - Georgian and Regency era". BBC. Archived from the original on 16 February 2010. Retrieved 9 November 2018. ^ ‹See Tfd›US RE 8560, ‹See Tfd›Passmore, Everett G., "Improvement in Lawn-Mowers", issued 28 January 1879 ; see pg 1, col 2. For a copy, see Google Patents copy. This source indicates the patent number as "6,080". According to "British patent numbers 1617 - 1852 (old series) Archived 17 October 2011 at the Wayback Machine", the patent number was assigned sometime after 1852 and took the form of "6080/1830". ^ "People at the cutting edge: lawnmower designers". Parks & Gardens UK (University of York/Association of Gardens Trusts). Archived from the original on 26 February 2012. Retrieved 24 May 2009. ^ a b c The Old Lawnmower Club. "Mower History". The Old Lawnmower Club. Retrieved 23 April 2011. ^ "The History of the LawnMower". Thelawnmower.info. Archived from the original on 22 July 2011. Retrieved 23 April 2011. ^ "Henrietta Barnett and the Beginnings of the Suburb". Archived from the original on 6 December 2013. ^ "Suburban Ideals on England's Interwar Council Estates". Retrieved 17 December 2012. ^ NASA Earth Observatory, 2003. ^ Teysott, Georges (1 June 1999). The American Lawn. Princeton Architectural Press. p. 18. ISBN 978-1568981604. ^ a b Trudgill, Stephan; Jeffery, Angus; Parker, John (2010). "Climate Change and the Resilience of the Domestic Lawn". Applied Geography. 30 (1): 177–190. doi:10.1016/j.apgeog.2009.08.002. ^ Wood, Richard V. (2002). "Richardson, Mervyn Victor (1894 - 1972)". Australian Dictionary of Biography. Canberra: Australian National University. Retrieved 25 August 2007. ^ a b Hogan, Trevor. " 'Nature Strip': Australian Suburbia and the Enculturation of Nature." Thesis Eleven 74:1 (2003): 54-75. ^ "Making Silage from Lawn Clippings". Grit. Retrieved 5 January 2016. ^ Logsdon, Gene (2004). All Flesh Is Grass. Ohio: Swallow Press. pp. Chapter 20. ISBN 978-0-8040-1068-9. ^ a b c d e f Bornstein, Carol, Fross, David, and O'Brien, Bart; 'California Native Plants for the Garden;' Cachuma Press, Los Olivos, CA; 2005; ISBN 0-9628505-8-6, 0-9628505-9-4. pp. 74-5. ^ Lunn, Matthew (7 September 2004). "Fact Sheet: Lawn Alternatives". Gardening Australia. Archived from the original on 3 September 2009. Retrieved 16 September 2009. 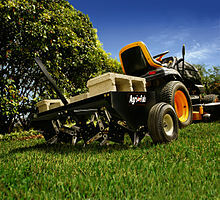 ^ "Lawn Aeration: What It Is, When to do it and Why It Helps". toolsaroundthehouse.com. August 2017. Retrieved 30 August 2017. ^ a b Christie, Mike (13 March 2007). "Private Property Pesticide By-laws In Canada" (PDF). The Coalition for a Healthy Ottawa. ^ "Why We Support a Province-wide Ban on Cosmetic Pesticides" (PDF). ^ Mittelstaedt, Martin (22 April 2008). "Ontario to prohibit cosmetic-use pesticides". The Globe and Mail. Archived from the original on 28 August 2008. ^ Benzie, Robert (22 April 2008). "Pesticide ban set to grow". Toronto Star. ^ "High Weed/Grass Complaint Process". City of Akron, Ohio. Archived from the original on 9 August 2010. ^ Trapp, Sara Jane Von (1997). Landscaping from the Ground Up. Taunton Press. p. 112. ISBN 9781561581856. ^ Dickinson, Greg (2006). "The Pleasantville Effect: Nostalgia and the Visual Framing of (White) Suburbia". Western Journal of Communication. 70 (3): 212–233. doi:10.1080/10570310600843504. ^ Fitzgerald, F. Scott. The Great Gatsby. New York: Charles Scribner's Sons, 1925. ^ Sedgman, K (1997). "Cutting Grass: In Search of the Australian Male". Australian and New Zealand Journal of Family Therapy. 18 (3): 143–147. doi:10.1002/j.1467-8438.1997.tb00284.x. ^ Coates, Peter (2004). "Emerging from the Wilderness: (or, From Redwoods to Bananas): Recent Environmental History in the United States and the Rest of the Americas". Environment and History. 10 (4): 407–38. doi:10.3197/0967340042772676. ^ a b Alumai, Alfred. "Urban Lawn Management: Addressing the Entomological, Agronomic, Economic, and Social Drivers." PhD., Ohio State University, 2008. ^ a b "Cut Your Lawn - In Half!". National Wildlife Federation. ^ Sayre, Laura. "Organic farming combats global warming--big time". Rodale Institute. Archived from the original on 12 June 2009. ^ Gu, Guanhui; Crane, Johne; Hornberger, George; Caricco, Amanda (2015). "The effects of household management practices on the global warming potential of urban lawns". Journal of Environmental Management. 151: 233–242. doi:10.1016/j.jenvman.2015.01.008. PMID 25585139. Retrieved 16 February 2018. ^ "Hosepipe ban". Retrieved 21 January 2015. ^ Milesi, Cristina; S.W. Running; C.D. Elvidge; J.B. Dietz; B.T. Tuttle; R.R. Nemani (8 November 2005). "Mapping and modeling the biogeochemical cycling of turf grasses in the United States". Environmental Management. 3 (3): 426–438. doi:10.1007/s00267-004-0316-2. PMID 16086109. Retrieved 5 November 2010. ^ Smith, David Ingle (1998). Water in Australia: Resources and Management. Oxford University Press. ISBN 9780195537048. ^ Alumai, Alfred; Salminen, Seppo O.; Richmond, Douglas S; Cardina, John; Grewal, Parwinder S. (2009). "Comparative Evaluation of Aesthetic, Biological, and Economic Effectiveness of Different Lawn Management Programs". Urban Ecosyst. 12 (2): 127–144. doi:10.1007/s11252-008-0073-8. ^ "Answers to Commonly Asked Questions from Dealers and Distributors" (PDF). U.S. EPA. August 1998. ^ "Lawns may contribute to global warming" by Judy Lowe, Christian Science Monitor, 22 January 2010. ^ "Retrieved 17 May 2010". sciencedaily.com. ^ Townsend‐Small, Amy; Czimczik, Claudia (March 2010). "Correction to "Carbon sequestration and greenhouse gas emissions in urban turf"". Geophysical Research Letters. 37 (6): n/a. Bibcode:2010GeoRL..37.6707T. doi:10.1029/2010GL042735. Retrieved 15 March 2012. ^ "Bees' Needs Week 2018". Bumblebee Conservation Trust. Bumblebee Conservation Trust. Retrieved 9 July 2018. Bormann, F. Herbert, et al. (1993) Redesigning the American Lawn. Huxley, A., ed. (1992). New RHS Dictionary of Gardening. Lawns: Ch. 3: pp. 26–33. Macmillan. ISBN 0-333-47494-5. Jenkins, V. S. (1994). The Lawn: A History of an American Obsession. Smithsonian Books. ISBN 1-56098-406-6. Steinberg, T. (2006). American Green, The Obsessive Quest for the Perfect Lawn. W.W. Norton & Co. ISBN 0-393-06084-5. Wasowski, Sally and Andy (2004). Requiem for a Lawnmower. 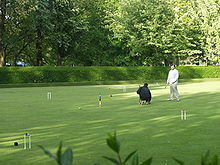 Wikimedia Commons has media related to Lawns. Wikisource has the text of the 1920 Encyclopedia Americana article Lawns. "Planting and care of Lawns" from the UNT Govt. Documents Dept.